When it comes to property features that impress your customers, concrete flooring might not be that high on your list, but life is about more than just making a good impression. Fixing the concrete cracks and joints that mar your flooring and other masonry is a smart way to save money. It also keeps your property in the best possible condition so that it can protect your investments. Here’s everything you need to know to whip your concrete into better shape. 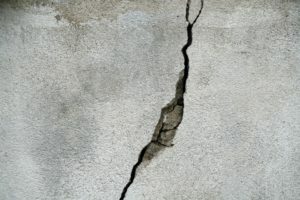 Although it may seem counter intuitive, the first step you should take when repairing cracked concrete is to widen the crack. The goal behind this is to get rid of any deteriorated or loose material that might continue to break down after your repair. To do this use a small hand grinder or chip away at the gap’s edges with a hammer and small chisel. Create a regular “V” shaped groove or widen the crack to at least 1/4 inch wide Then use a brush or vacuum to remove any loose debris. Try to maintain a regular width and depth when you widen the crack. Concrete filler products come in a variety of forms. From tubs of paste to caulk tubes, there are numerous options. You should pick something you’re comfortable using, but make sure that whatever you buy has enough sealant or filler to deal with the deficiency you’re fixing. Always read the instructions carefully before using or even opening a product. Look out for maximum crack size limitations and depth restrictions. For instance, some products are only designed to fill gaps of a certain width and require you to reinforce wider deficiencies with special hardware before the application of the filler or sealant. If you were careful about chiseling or grinding your repair area, you should be able to cut the nozzle of the caulk tube to match the width of the repair. From there, you’ll want to begin squeezing caulk into the target area evenly to ensure that the caulk bead completely fills the gap. Concrete repair products that don’t come in tubes require a bit more manual dexterity to apply or pour into a hole. Once again, a target with regular dimensions makes it easier to get the hang of the process and be consistent. After laying the bead of caulk or filling the crack, consider using a trowel to smooth out your work. This is a good way to ensure that the results blend in better with from the floor you were originally trying to repair. Now is also the right time to clean up any excess sealant or filler before it dries. Some fillers may function best when you let them set for a while and then perform a subsequent application, such as when you’re trying to fix a particularly wide or deep crack. Does your industrial or commercial facility’s concrete floor need repair? To find out more about the process, request a quote from Northern Industrial Flooring today. Build your restaurant from the ground up with beautiful non-slip floors. When you choose flooring for your restaurant, you can choose to match your various zones of use to different flooring products or select a single type of non-slip floor that works well throughout. Your primary concern is likely safety, since nearly 200,000 restaurant employees get hurt on the job during a typical year, according to Food Newsfeed, but you have other criteria too. Learn about the options in commercial and restaurant flooring so your establishment is a safe, comfortable and attractive space. As a guest’s first impression of your restaurant, your entry has to be inviting, attractive and spotless. Also, since your customers will be tracking the outside in, it must be easy to clean. On top of that, your entry floor should be non-slip and compliment the decorating theme of your dining room. Coated concrete flooring is an attractive, low-maintenance and moisture-resistant option. As far as aesthetics, you can choose from solid colors to decorative metallic designs. The most important feature to look for in restaurant kitchen flooring is a non-slip surface. Slip and fall injuries are among the most common mishaps for restaurant employees nationwide. No matter what kind of flooring you select for other parts of your establishment, easy to clean, non-slip flooring is a must in the kitchen. It should be durable enough to handle non-stop traffic, high-temperature spills and cleaning solvents. Oh, and it should be resistant to mold and bacteria too. One new product that fills the bill perfectly is USDA urethane cement. It meets the health and safety standards for restaurant flooring while providing a seamless surface that looks great over the long-term. It contains tiny particles of silver that prevent microbial growth, which helps with keeping your kitchen exceptionally clean. 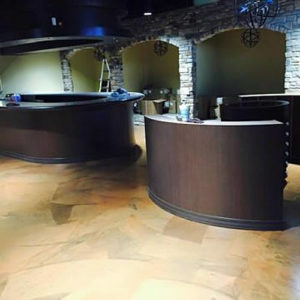 Northern Industrial Flooring of Angola, Ind., is your source for restaurant and commercial flooring that promotes safety, adds value and instills your restaurant with decorative flair. Contact us today for more information and/or to request a quote. We’ll help you present your restaurant at its very best. You work hard to keep those who work for your enterprise as safe as possible. Providing a proper professional environment is an undeniably important aspect of avoiding costly accidents and ensuring that people don’t get injured. Like other employers, you probably take steps to mark safety facilities, such as fire extinguishers, eyewash stations and emergency egress routes. What you may not realize, however, is that OSHA also promotes safety improvements in an unlikely area: Your floors should have markings that help guide traffic and indicate hazards. Here’s how to use floor striping and painting the right way. Like many OSHA policies, the agency’s floor striping standards aren’t defined in a single rule or regulation. In fact, the agency doesn’t explicitly state how factories, warehouses and other facilities should use different colors to mark their floors. 29 CFR 1910.144: These specifications discuss how to mark physical dangers with different colors. Although they don’t explicitly mention floors, they offer some guidance on commonly accepted marking color schemes, such as using red for emergency stop switches and yellow for physical hazards. 29 CFR 1910.35: This regulation clarifies how OSHA refers to other rules concerning exit routes, like the 2009 editions of the International Fire Code and NFPA 101 Life Safety Code. 29 CFR 1910.176: Although this rule pertains to handling materials such as mechanical equipment, it also touches on the need to mark permanent aisles and passageways. Even though OSHA leaves you with some leeway about how you follow the guidelines, uncertainty is no excuse for not having markings at all. You just have to be thorough about reading the rules. For instance, although 29 CFR 1910.176 doesn’t say what constitutes an “appropriate” marking, you can obtain guidance from the agency’s additional commentaries. In 1972, federal regulators released a standard interpretation deeming that most aisle marking lines needed to be between 2 and 6 inches in width. This letter also said that the aisles themselves should be 3 feet wider than the equipment you plan to use in them or a minimum of 4 feet wide. Companies that manufacture marking tapes seem to adhere to this take on the rules since it comes from an official source. Factory and warehouse floor markings do far more than just ensure worker safety. Establishing a system that makes it easy for your employees to do their work properly reduces the incidence of accidents that might damage your facilities. To learn more about leveraging OSHA floor marking standards for your company’s long-term benefit, contact Northern Flooring.